DUMBARTON fought bravely but were well beaten by SPFL Championship contenders Rangers at a packed Bet Butler Stadium. A total of 1,850 fans — or so it has been reported, although it looked as if there was not a seat to be had in the 2,025 capacity stand — managed to make their way past a massive stewards and police cordon in a security operation similar to a royal visit. They saw an entertaining game, with Ian Murray's men starting far more confidently than they did on their recent visit to Ibrox. They defended well in front of the internationalist strike force of Kenny Miller and Kris Boyd, but were largely restricted to shots from distance. Mark Gilhaney set up a great chance with a low cross in front of the keeper, but there were no takers. Referee Andrew Dallas, not a popular figure with the home crowd in the first half, awarded a debatable penalty to Rangers in the 24th minute, but keeper Danny Rogers made a great save from Ibrox skipper Lee McCulloch (pictured). 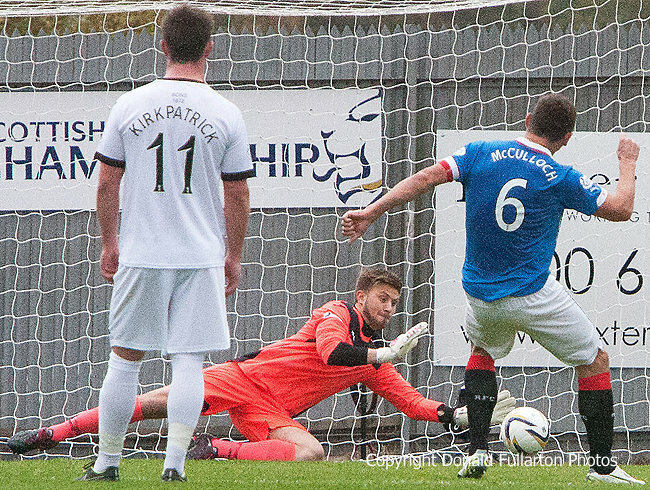 However two minutes later Ally McCoist's side took the lead when Miller drove home a pass from Steve Smith. More chances followed, but half-time arrived with the scoreline still 1-1. It took the Ibrox men until the 61st minute before they added no.2, Lee Wallace shooting home, and 12 minutes later Boyd sent in a perfectly placed header for the third goal. There was no way back for the home side.